Possible Causes of a Power Outage on a Sunny Day - New England Electrical Contracting, Inc. Whether a tree gets blown down onto a power line or a lightning strike hits a transformer, we’ve all experienced a power outage during the middle of a severe thunderstorm or windstorm. But have you ever been sitting at home on a sunny day when the power suddenly goes out? It happens a lot more often than you’d think! There are a few common causes of these sunny-day outages—continue reading to learn what they are and how we may be able to help with electrical repair in Trumbull, CT. If your electrical company is planning on doing any work in your area, they’ll most likely need to shut off your power for a period of time to complete the task. This is for their safety, and to ensure that they’re able to finish the job. Check your provider’s webpage, or give them a call to see if any outages are planned in your area before you start to freak out about losing power. Luckily, these planned outages often only last for a few minutes! A car driving into a utility pole, an animal touching a transformer or a construction accident can all lead to outages. Depending on where the accident occurred, these accidents—which seem small—can affect hundreds or even thousands of customers. Rest assured that your power company will be on top of the problem to get your power back up and running as soon as possible. If you live in an older home, there’s a good chance that your wiring could be the issue in a sudden power outage. Older wiring sometimes can’t handle the necessary electricity load that we need for our everyday appliances. Consider talking to an electrician about rewiring your home. Though it might be expensive, rewiring could save you from an electrical fire or any future power outages. Another problem with your wiring might also have to do with pests, or even your own pets. Animals, especially rodents, like to chew through wires. As you can imagine, that leads to big issues, and can even be the cause of a power outage. Again, give us a call and let one of our electricians inspect your wiring. You can trust that we’ll get to the root of the problem in no time. How many appliances do you have plugged into a single outlet? Two? Three? Four? That’s not wise! Plugging too many appliances into a single outlet can overload your circuit breaker and cause it to trip. The good news is that flipping a breaker back on should solve the problem. However, if that doesn’t work, you’ll need to call an electrician to fix whatever’s wrong. 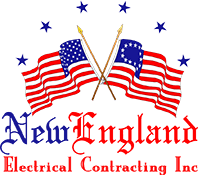 If the reason for your outage has something to do with a problem with your wiring, or maybe even user error, be sure to call New England Electrical Contracting, Inc. for electrical repair in Trumbull, CT. One of our 24-hour electricians will be on site as quickly as possible to repair whatever damage is done so that you can get back to life as usual.